Organic Chocolate Egg with 70 % Cocoa Solids. 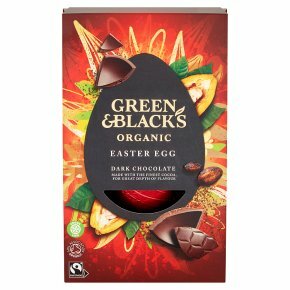 Easter is the perfect time of year to treat your special someone to a thick-shelled, dark chocolate egg. Suitable for vegetarians. Made with the finest cocoa, for great depth of flavour. We source the finest cocoa, prized for its wonderful complexity and great depth of cocoa flavour. Discover notes of sour cherry and raisin balanced with savoury flavours.